After festering in the mind of writer/director George Miller for more than a decade, the fourth installment of the Mad Max series is finally here—and boy was it worth the wait. More of a reboot of the franchise than a sequel, Fury Road is an aesthetic masterpiece and a truly unique 21st century action thriller. Miller’s universe has been rendered in painstaking detail, and the result is a pulse-pounding two hours of pure anarchy. 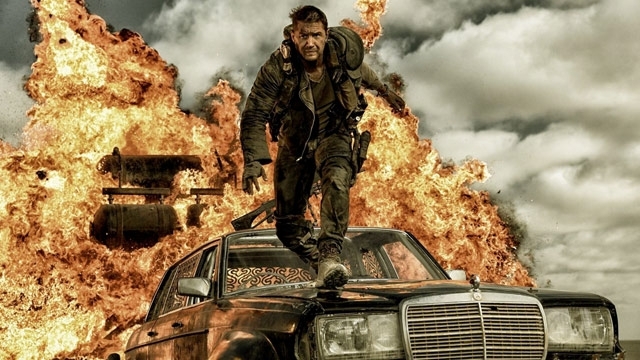 The film opens with a brief monologue by Max Rockatansky (Tom Hardy) that sets the stage for the barren wasteland the story takes place in: Nuclear war has devastated the earth, and the warring factions that remain have been driven to bloodshed in their search for fossil fuels and human life. Max is quickly captured by the War Boys, the deranged, albino disciples of despot King Immortan Joe (Hugh Keays-Byrne), and taken to their base, the Citadel. He is deemed a “universal donor” and is hooked up to an IV to pump his precious blood into the body of an ailing War Boy named Nux (Nicholas Hoult). Meanwhile, stoic war-rig driver Imperator Furiosa (Charlize Theron) prepares for a dangerous mission to the nearby Gas Town in order to obtain fuel and sustenance for the faction. Furiosa has secretly smuggled Joe’s five young brides into her rig and plans to leave the faction for good, but when the warlord learns of this scheme, he launches an all-out assault to retrieve his wives and recapture Furiosa. The tumor-pocked Nux deems himself fit for battle, and affixes Max to the front of his war machine to supply a steady stream of healthy blood into his system. Thus begins the descent into chase-movie madness. While the plot of redemption and survival is nothing new for the action-movie circuit, Fury Road’s stylization is simply astounding. The choreography of the vehicular chases is expertly paced and never feels exhausting. Viewers will be able to count the noticeable instances of CGI on one hand—the film’s death-defying stunts were mostly done for real—and that’s quite a feat given modern cinema’s overreliance on computer-animated action. Every element of the movie fits perfectly into the wasteland setting thanks to cinematographer John Seale, and each nuance immerses the viewer in Miller’s infernal landscape. Deformities are the norm in this post-nuclear world, yet the filmmakers never exploit these oddities; instead, they’re used to provide context for the desperation and hopelessness in Fury Road. There is so much to unpack in Miller’s universe that it rightfully deserves multiple viewings. Theron elbows Hardy out of her way and shines the brightest amidst this hellscape. Her performance balances strength and compassion, and defies most of the usual conventions of action flicks. Hardy has little dialogue, instead portraying Max as a reserved loner who’s haunted by the hallucinations of his past mistakes. He’s no superhero, yet his checkered history becomes an inspiration rather than a hindrance as he decides to help protect Furiosa and the brides. Although, ironically, it’s Furiosa who must often come to the aid of Max, making the film distinctly female-driven. Hoult also delivers a spectacular performance as the brainwashed Nux. Mad Max: Fury Road is a magnificent attack on your senses, and the ferocious picture will no doubt be held in high esteem in the annals of action classics. The roaring of the steampunk (and supposedly drivable) war machines, the crazed battle drummers and metal guitarist, the nonstop chase scenes, and the earsplitting sound editing will leave viewers searching for a way to pick their jaws up from the theater floor. What a lovely day, indeed.